Shannon Thwaites, Manager - Global Business Events at Destination Gold Coast has been awarded the prestigious AACB Staff Scholarship for 2018/19. 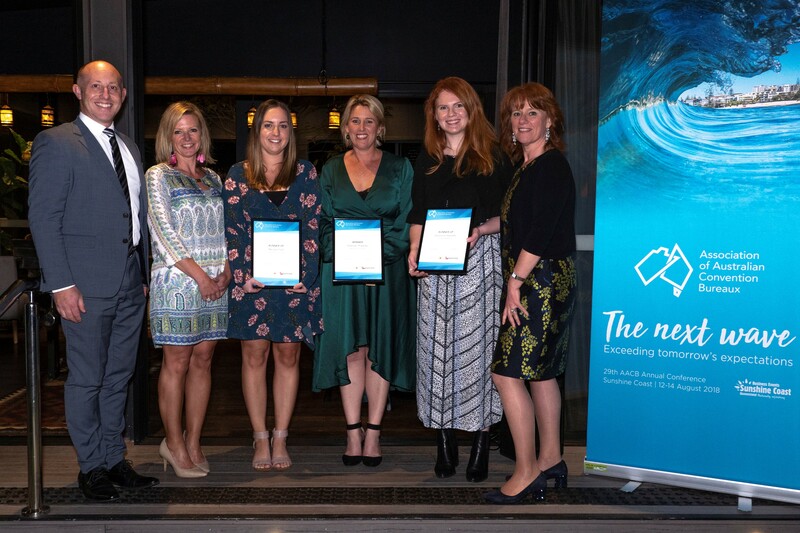 The Scholarship was announced at the AACB Annual Conference AIME Gala Dinner held at Spirt House Restaurant and Cooking School on the Sunshine Coast. The AACB Staff Scholarship is designed to offer bureau staff an opportunity to demonstrate their professional commitment to the business events industry by delivering a project which highlights innovation and excellence. With her winning proposal to future proof talent in the business events industry, Shannon’s project will investigate ways to cultivate specialised industry talent, analyse methods to transfer knowledge and experiences and to connect current leaders with future leaders. Shannon has secured a $5,500 cash grant to kick start her project and international return flights to the US. The scholarship is co-sponsored by Tourism Australia and Qantas. Both recognise the important role that convention bureaux play in attracting business events to Australia and therefore see this scholarship as an investment in the future leadership of the industry. Penny Lion, Executive General Manager Events at Tourism Australia, and Rob Harrison, Head of Agency Partnerships, Qantas both congratulated Shannon on her success in winning the Scholarship. “Shannon’s commitment to engage the industry, encouraging high performance and equipping individuals with the skills to lead Australian convention bureaux is of utmost importance to the future of the industry. Congratulations Shannon,” Mr Harrison said. The scholarship runners-up were Stephanie Heyneke, Business Development & Bidding Coordinator, Brisbane Marketing and Melissa Trost, Business Development Executive, Destination Gold Coast. Photo (from left to right): Andrew Hiebl, CEO, AACB; Leisel Shaw, Partnership Marketing Manager, Tourism Australia; Melissa Trost, Business Development Executive, Destination Gold Coast; Shannon Thwaites, Manager - Global Business Events at Destination Gold Coast; Stephanie Heyneke, Business Development & Bidding Coordinator, Brisbane Marketing; Karen Bolinger, President, AACB.